At the Mississippi Mills Animal Hospital we have chosen to use digital x-rays to produce high-quality images of our patients. X-rays are most useful for viewing solid tissues and areas of the body that have contrasting tissue densities. In the chest, for example, the lungs are primarily filled with air and have a very soft density so that they absorb very few x-rays. The heart muscle is denser, while the bony ribs are hard and extremely dense. The heart silhouette is easily seen on an x-ray and large blood vessels can be seen within the lungs since the blood and arterial and venous walls are denser than the surrounding lungs. If fluid accumulates in the lungs (pulmonary edema), it is also readily seen. In the abdomen, many organs can be distinguished and foreign bodies or air trapped within the intestines may often be observed. 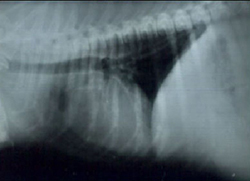 The size and shape of the liver, kidneys, and spleen are often assessed on radiographs. In animals that are extremely obese or that have very little body fat, it can be more difficult to distinguish the various internal organs. The bones of the spine and limbs are routinely x-rayed and many bone abnormalities can be readily detected. Joints can be challenging to analyze due to the similar soft tissue density of ligaments and tendons. Your veterinarian is most often looking for cavities or abnormal swelling within a joint or for abnormal positioning or orientation of bones. Dental radiographs are an essential part of determining which teeth are healthy and whether certain teeth need to be extracted. Abnormalities beneath the gums that would otherwise go unnoticed, such as tumours, abscesses, and damage to the tooth roots, can be seen on a dental radiograph. The brain is one area that cannot properly be seen on x-ray because bones of the cranium absorb all of the x-rays which prevents viewing of the brain tissue. Details of internal structures such as the inner structure of the heart, the bladder, or other abdominal organs, as well as many joints and the lungs are better viewed with computed tomography (CT), magnetic resonance imaging (MRI), or ultrasound (US).